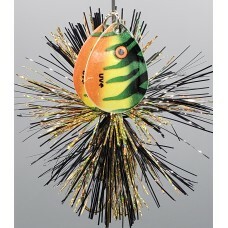 The Firefly Series double 7/0 bladed, bucktail type in-line spinner baits from Spanky Baits features a unique action "FLASHABOU" Tail. This 4 inch lure is the "Little Brother" of the Fireball Series! These lures have a crazy action and attract fish in a big way. The vibration of the magnum blades along with the visual addiction of the Flashabou makes this a lure that will go down in history. All this lure does is catch monster fish! 65 color tail patterns made with high quality, commercial flashabou.